The patriarchal narratives of Genesis are some of the most beloved passages in the Bible. They are also some of the most heavily criticized. Before the middle of the 20th century, many scholars assumed the historicity of the patriarchs. In the 1970s, two minimalists published what is regarded by many in academia as one of the greatest of one-two punches in the history of biblical studies. John Van Seters (Abraham in History and Tradition, 1975) and Thomas Thompson (The Historicity of the Patriarchal Narratives, 1974) each questioned the historicity of the patriarchs. Their study was so influential in academic circles that, since that time, few scholars have written in support of the historicity of Abraham, Isaac, and Jacob. Van Seters and Thompson are much like other critics who feel quite comfortable in approaching the Bible with a level of academic condescension and suspicion that is nearly unparalleled in other disciplines. Although their work was helpful in weeding out faulty assumptions and recognizing instances of misuse of archaeology, their objections go too far and are flawed. Scholars have answered them accordingly. In his book The Bible in its World (1977), Kenneth Kitchen first tackled the objections raised against the historicity of the patriarchal narratives. Others scholars have followed (see Millard and Wiseman, 1983; Yamauchi, 1994). Ancient Near Eastern scholarship has continued to vindicate the patriarchal narratives. One particularly interesting piece of archaeological data comes from the modern village of Beni Hasan, which lies 160 miles south of Cairo. 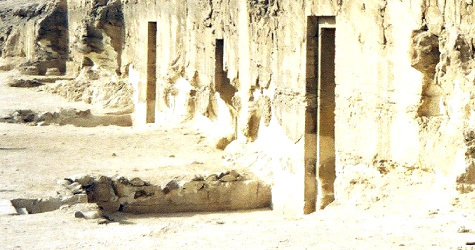 It is home to 39 monumental tombs of Egyptian officials from the Middle Kingdom Period (2050-1650 B.C. ), in addition to a few tombs from the Old Kingdom Period (2686-2186 B.C.). The tomb of a nomarch (governor) named Khnumhotep II is particularly interesting for the study of the patriarchs. The walls of Khnumhotep’s tomb contain paintings portraying scenes from his life. The most famous, however, is a depiction of a caravan from Canaan. The accompanying hieroglyphic inscription indicates that there were 37 members of this caravan. The exact purpose of their visit is debated among scholars, but most agree that it was some kind of commercial venture (Hoffmeier, 1996, p. 61). The differences between the Egyptians and the Canaanite merchants depicted in the scene is immediately obvious. While the Egyptians wear their customary white linen kilts, the merchants wear multi-colored garments. The clothing worn by the men is a sign of their wealth. This calls to mind the passim of Joseph that sparked jealousy in his brothers (NOTE: the Hebrew word passim, or “coat,” is difficult to understand because it appears only twice in the Old Testament. While interpretations include “long-sleeved,” “multi-colored,” and “decorated,” it would appear that being multi-colored would be an attractive possibility, since to have such a garment would be quite costly). The merchants also have full heads of hair with beards. This differed from Egyptian men, who shaved their heads and faces (cf. Genesis 41:14). The Beni Hasan tomb painting recalls two important details about the patriarchal narratives in Genesis. First, each of the patriarchs spent time in Egypt. The fact that they traveled in groups—as in the case of Jacob prior to his encounter with Esau (Genesis 33), as well as his move to Egypt with the extended family (Genesis 46)—also fits the biblical text. Second, the fact that the merchants move relatively freely in Egypt is reminiscent of Egyptian-Canaanite relations prior to the Hyksos invasion. Prior to the arrival of the Semitic rulers known as the Hyksos (c. 1750 BC), Egyptian rulers allowed settlers from Canaan to settle temporarily in the northeastern corner of the country during times of famine (although they did build a line of forts to regulate the visits of these visitors). The border was permeable, and visits from Canaanite people were often permitted. This changed after the Egyptians drove the Hyksos from Egypt. The Hyksos were foreign rulers who took control of the northern part of Egypt. Scholars are uncertain whether they came to power by peaceful infiltration or military invasion. What is indisputable is that this takeover engendered hatred on the part of the Egyptians. After the Hyksos had been expelled by pharaoh Ahmose I (c. 1560 B.C. ), the Egyptians became somewhat xenophobic and had a particular dislike for Canaanite peoples (often calling them “wretched Asiatics”). The fact that the book of Genesis preserves this memory of Egypt’s permeable borders means that the stories had to exist prior to seventeenth century B.C., when the Hyksos invaded. Later Hebrew scribes could not have known these historical details and would have had no reason to invent them. Although the patriarchs are not mentioned by name in any extant historical or archaeological sources, this should not be cause for concern among Christians. Archaeology rarely speaks to any single individual, especially when it comes to those who are not nationally or internationally known (e.g., kings, high-ranking political officials, and important religious figures). It also shows that the narratives in Genesis fit with the proper time period. Later scribes could not have known some of the details presented, meaning that the text of Genesis is not a later fiction as many critics attempt to claim. Far from showing the unreliability of the Bible, archaeology has proved to be one of Scripture’s strongest allies. Hoffmeier, James L. (1996), Israel in Egypt (Oxford: Oxford University Press). Kitchen, Kenneth A. (1977), The Bible in its World: The Bible & Archaeology Today (Carlisle: Paternoster Press). Millard, Alan and Donald J. Wiseman (1983), Essays on the Patriarchal Narratives (Winona Lake, IN: Eisenbrauns). Thompson, Thomas (1974), The Historicity of the Patriarchal Narratives: The Quest for the Historical Abraham (Berlin: Walter de Gruyter). Van Seters, John (1975), Abraham in History and Tradition (New Haven, CT: Yale University Press). Yamauchi, Edwin (1994), “The Current State of Old Testament Historiography” in Faith, Tradition and History. Alan R. Millard, James K. Hofmeier, and David W. Baker, eds. (Winona Lake, IN: Eisenbrauns).